Our family was celebrating my nieces 50th birthday on New Year’s day. I wanted to do something special for her so I decided to make a mixed media Birthday canvas. I had a general idea of what I wanted to do and was able to find the needed supplies at my local crafts store. I started with a 5x7x2 wooden canvas (you could use a regular canvas), I wanted to put her age on the canvas, her initial, a crown, and possibly feet on the project so she could sit it on a table. I decided I wanted to have music in the background and found a free downloadable of “Happy Birthday”. I torn around the edges of the sheet of music and then used matte medium to glue it to the canvas. I also painted over the top with matte medium. I then put a few drops of Buttermilk paint on the canvas and moved the paint around with a credit card. If you need more instructions on this technique go over to this blog post. Celebrating always means cake to me, so I decided to put a cake on the canvas. I also painted her initial, age, and the crown. By this time I realized I wanted Happy Birthday to be a little lower so I printed it out again, tore around the words and used matte medium to glue to the canvas. I painted the icing Poodleskirt Pink, and the cake plate Baby Blue. I shaded the cake sections with Honey Brown and used Grape Juice and Emperor’s Gold on the extras. These are all DecoArt paint colors. I wanted to add some details to my design using sequin waste and a stencil. Both of these are available from Amazon. You could use any stencil(s). Using the sequin waste and Honey Brown I added more details to the cake. I printed the word “Celebrate” and cut out each letter and attached it to the front. I also added different element from the stencil to the front, top and sides. I also outlined the cake with my Faber-Castell PITT white marker (I love this marker). I highlighted and shaded the icing and cake plate. I also added her name and birth date on the sides. The “icing on the cake” so to speak was the glitter and glitz. I added the glitter to each of the elements, and rhinestones to the crown, and then glued them in place on the canvas. I placed matte medium on the top layer of icing and sprinkled with seed beads and then added glitter to the icing. I choose a small candle stick for the base. 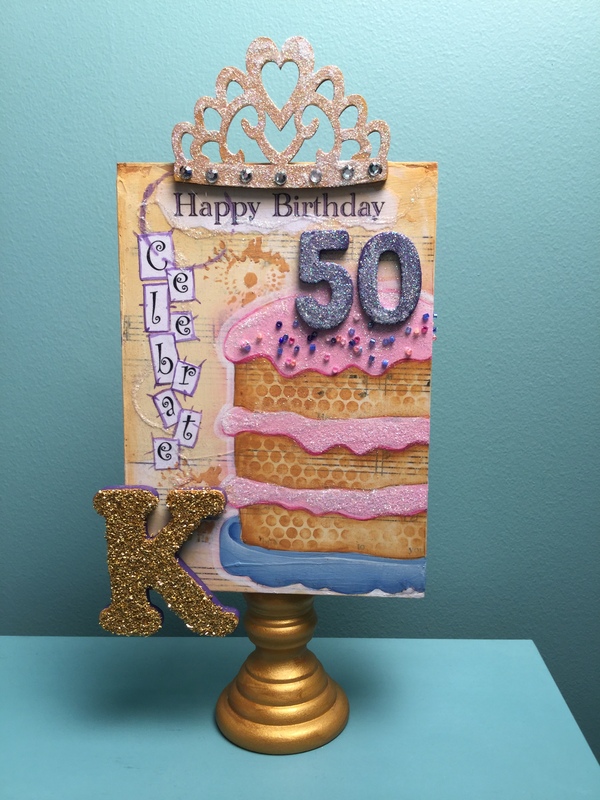 This project worked up quickly and is a fun reminder for my niece of her special day. Here is a PDF file with the pattern, background and word “celebrate” if you would like to make this project. Hope this post will give you some ideas for celebrating a special person in your life’s birthday. Thank you Jessy, it was fun to do. I always think it is more special when we make something. Oh I love this, Jane. I love projects that make it personal & meaningful plus artsy & fun! Will definitely be doing this! Thank you! Thank you Susie, so glad that you like it. I know that you are someone who likes to bless others. Love it Jane…Yes, Celebrating always means CAKE to me ! …and what a better way than with a keepsake cake! Thank you Amy, love how we think alike!